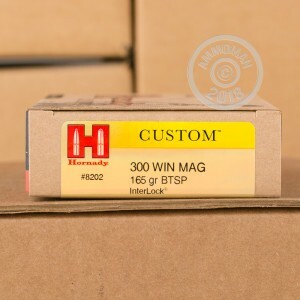 More popular than any other 30 caliber, magnum, hunting round in the United States, the 300 Win Mag is a highly effective, incredibly accurate round with great range. Whenever you need to go hunt in the plains and valleys in the west or just need a high powered rifle to use in the woods, the 300 Win Mag is the round for you. 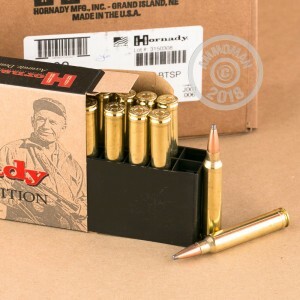 Hornady has been around since 1949, founded out of a need for high quality, accurate, and reliable ammunition. These 300 Win mag rounds feature 165 grain soft point projectiles that offer controlled expansion and excellent penetration for hunting medium and big game. Each bullet is loaded in to brass casing that comes boxer primed and is re-loadable. 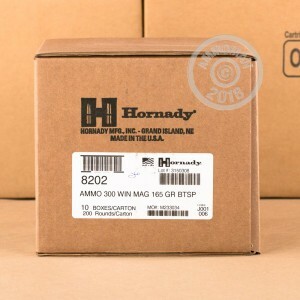 Hornady's Custom line delivers high quality components and performance at a competitive price. Remember, if you place any order on AmmoMan.com over $99 your order will ship for FREE!